One of the latest trends on the Internet is the use of Social Networking Media. These are a group of Internet-based applications that are used for social interaction and communication. Social Media applications such as Facebook*, Twitter* and YouTube* allow people to store, share, discuss or deliver information to other people or online communities. Social networking sites have become very popular and are being used by various categories of people. While many people use these sites to stay connected with friends and relatives, they are also used to reach out to new people with common interests. Small businesses have also started using such sites to share information about their products and services. In order to use a Social Networking site you have to first register on it, create your profile and then start your interactions. In this activity, we will use Facebook which allows you to create and share information, videos, photographs and other content about yourself and your business with friends and other communities. Note: You should create an email id for yourself before you can register and start using Facebook if you do not have one already. 1.” Start” the web browser. Click to place your cursor in the Address or Location bar. Type http://www.facebook.com. Note: Make sure that you type the Web site address correctly since a typing error may take you to a different Web site that does not work. Press the “Enter” key on your keyboard or click the “Go” button. Then, wait as the Web page loads on your computer. 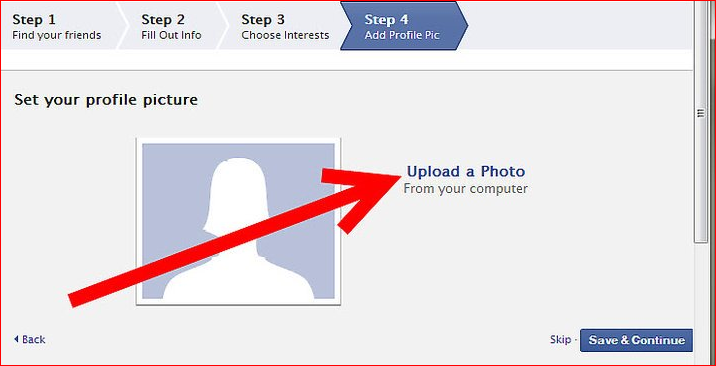 Before you can create a page for your business or create your own profile, you need to sign up for a Facebook account. Read the page and look for Sign Up. You will notice some boxes, which appears like a form. 2. Fill in the registration details in the boxes, such as your: Name, Last Name (Surname), Email address, Password, Gender and Date of birth. Note: You can use your email address that you had created. Remember to type in a new password for security reasons. Click ‘Sign Up’. 4. Confirm your email id by going to your mail and clicking on the link to confirm that the email id that you provided is being used by you. Confirm your email id by going to your mail and clicking on the link to confirm that the email id that you provided is being used by you. The first step is to ‘Add Friends’. You will find a list of suggested profiles from Facebook who may be your friends. Those who have sent a friend request to you will have a ‘Confirm’ button while the Facebook suggestions will have ‘Add Friend’. If you click on the ‘Confirm’ button, that person will become your friend. If you click on ‘Add Friend’ button, a friend request is sent to the person and he/she will have to ‘confirm’ your request. The second step is to ‘Find Friends’. You will have to provide your email id and Facebook will check if the contacts in your email are already registered on Facebook. 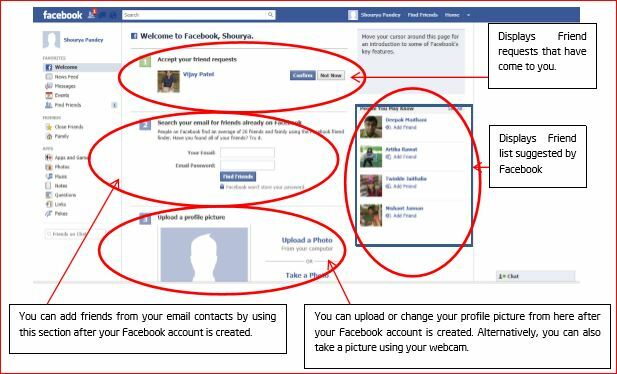 If some of the contacts from your email id are already on Facebook, you can send an ‘Add Friend’ request to them. When they confirm your request, they will be added to your list of friends. The third step is to provide ‘Profile Information’. You will have to provide your personal information e.g. school/college details, employer details etc. The fourth step is to provide your ‘Profile Picture’. This picture will be displayed in your friends list of friends. Note: You may skip each of these steps by clicking on “Skip“. However, you can fill the information required in these steps at a later stage if you skip them during the registration process. If you have provided information in any of the 4 steps, click on “Save & Continue” to proceed. Your Facebook account is created. Your Facebook page appears as below. 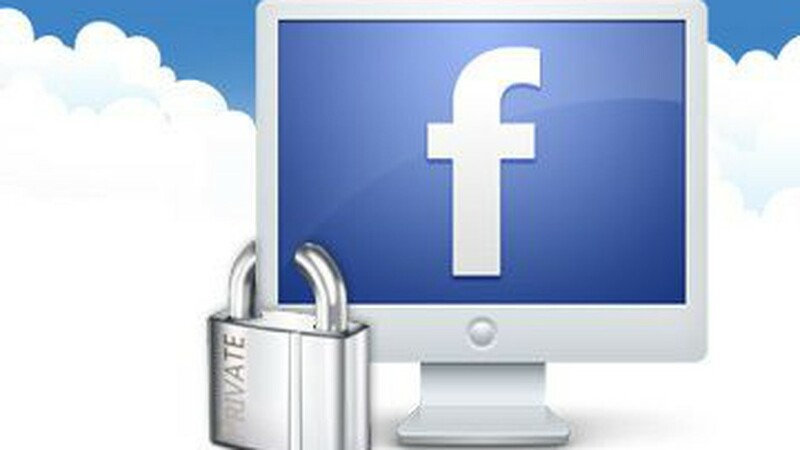 Having a Facebook account allows you to post status messages, which can be seen by your friends. To post a status message, click to place your cursor in the box under Update status. Type your message. Then click “Post“. Click to place your cursor in the comment box. Type your comment and press Enter on your keyboard. The Facebook bar has options for doing various activities. How many of these words and phrases will you get into your next post? And are any of your favorite Ask Questions missing from our post? Let us know in the comments below!